A look at carbon dioxide vs. global temperature | Watts Up With That? The piece below appeared in op-ed pages of many newspapers and online recently, released by by Agence-France-Presse (AFP) one of the largest news agencies in the world. I saw it in the Korean Herald, September 9, 2014 edition, and it appeared in most newspapers all over the world, including and especially developing economies such as Indonesia, Thailand, Philippines, etc. This is the latest example of emotional propaganda pieces presenting alarmist one sided messages to push public opinion and policy action. GENEVA (AFP) — Surging levels of carbon dioxide sent greenhouse gases in the atmosphere to a new record in 2013, while oceans, which absorb the emissions, have become more acidic than ever, the UN said on Tuesday. Meteorological Organization that released a report on the issue on Tuesday. “We must reverse this trend by cutting emissions of CO2 and other greenhouse gases across the board,” Jarraud said in a statement. “We are running out of time,” he warned. Concentrations of carbon dioxide, methane and nitrous oxide all broke fresh records in 2013, said the report. Global concentrations of CO2, the main culprit in global warming, soared to 396 parts per million last year, or 142 percent of pre-industrial levels — defined as before 1750. That marked a hike of 2.9 parts per million between 2012 and 2013 alone — the largest annual increase in 30 years, according to the Greenhouse Gas Bulletin. The report also showed that so-called radiative forcing, or the warming effect on our climate attributed to greenhouse gases like CO2, increased 34 percent from 1990 to 2013. A quarter of emissions are absorbed by the oceans, while another quarter are sucked into the biosphere, naturally limiting rates of warming gases in the atmosphere. But CO2 remains in the atmosphere for hundreds of years and in the oceans for even longer. The gases stored in the oceans also have “far-reaching impacts,” WMO warned, since more CO2 in the water leads to increased acidity, altering the ocean ecosystem. Every day, the world’s oceans absorb some four kilos of CO2 per person each day, WMO said, calling current ocean acidification levels “unprecedented at least over the last 300 million years.” And things will only get worse, Jarraud said. This press release like most climate advocacy today focuses on CO2 level increase without acknowledging and avoiding mentioning any hiatus in global temperatures – either current or the one that occurred during mid 1940s to mid 1960s. But the hiatus is so important to understand because this appears totally inconsistent with the IPCC position that today (in the AR5) the probability / likelihood now of human activities causing climate change is much greater than in previously, in past AR assessments. So why is it such a difficult question to understand let alone mention? In attempting to better understand this myself I took brief look at the data – Mauna Loa CO2 (ppm) data vs. NASA GISS global mean (absolute) land temperatures. The CO2 data starts in 1959 which limits the analysis to 1959 to 2014 to date. Basically – for this data set – all of the increase in temperature has taken place during mid 1970s to late 1980s. IPCC’s “climate sensitivity,” which is the modeled temperature increase for a doubling in CO2 relies heavily on the temperature rise during this period of time. There is significant loss of fidelity in the data with multi period time averaging. But this is a neat thing to do if one wishes to control the messaging, which we see all the time including recently. Of course another huge issue is cherry picking data/ time periods to include in the analysis. 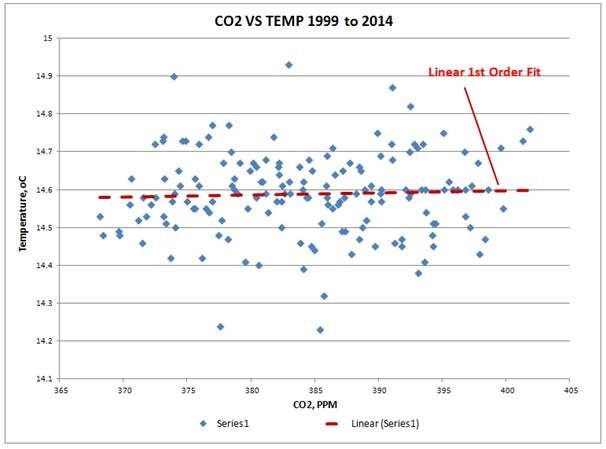 A better way to look at this is in cross plots of the corresponding CO2-temperature data as shown below. If there is 95% certainty that global warming is predominately caused by manmade activities the relationship should be easily discernible … including by the naked eye. In fact the cross plot below covering over the period mentioned there were two hiatuses totaling 35 years out of the total 56 years (nearly two-thirds of the time), exhibiting no or very little correlation between CO2 and global mean temperature. So how can the IPCC in AR5 increase the probability (to 95%) of manmade causes being the overwhelming predominant and by implication the only important forcing of global warming? (my question). Focusing on the most recent hiatus below, both visually and in a 1st order linear regression analysis there clearly is effectively zero correlation between CO2 levels and global mean temperature. In “statistician speak” the correlation between CO2 and temperature is not significantly different than zero. Specifically for the period 1998-2014 (to date) the XY plot has an R squared of 0.0068. 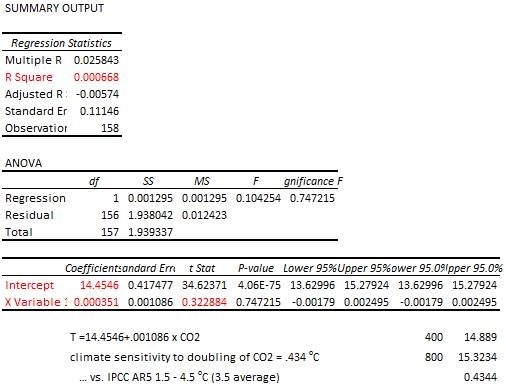 The AR5 climate sensitivity is 2-4.5oC for a doubling of CO2, with most like value of 3oC, whereas these data suggest a value more like 0.4 oC for a doubling of CO2 (which is indeed meaningless given the R squared). September 12, 2014 in Carbon dioxide. CO2 and Manchester United’s tally of [English Football] League titles [now the ‘Premiership’] have also moved upwards more-or-less together for a while. Was Man U’s success causing the rise in CO2? This is all part of the news/press propaganda campaign started with the UN WMO kick-off of its “carbon-is-the-devil” schitck earlier this week. It will get worse as we head into the 21 September Climate propaganda rally in NYC. (BTW, I’m still banking on an “Al Gore Wx” event for that rally). Even as the Earth likely cools in the coming years, the UN’s WMO must make CO2 the bogeyman in our ever changing climate (warmer or colder). Making CO2 the boogeyman is the only way to extract money from CO2 emitting developed nations to the less CO2 emitting 3rd World nations. The money is extracted from the poor to the rich and bureaucrats. It’s profiteering – nations play little role. Looks like “greenmail” (green as in watermelons) again…. Right, except that it is the developing nations that have by far the largest increase in emissions, while many developed countries are more or less stagnant. And in the UN system, both China, India and South Korea count as developing nations and have thus no demands for reduction. China is today, I believe, the world third in total emissions. per capita of course far less than the US, but getting close to some large European countries. conTrari – good points, couple of comments. South Korea has experienced incredible growth based on technological innovation and international trade especially in electronics, automotive, etc. In the 1960s, South Korea’s GDP per capita was comparable with poorer countries of Africa and Asia. It became a member of the OECD in 1996 and currently GDP PPP is around $1.7 trillion. It joined the OECD in 196. China absolute CO2 emissions surpassed US emission making it the no.1 CO2 emitter in the world. CO2 emissions from fossil fuels in China and the US were both around 6500 million tons in 2007 (each representing around 21% of the global total). By 2013 China’s CO2 emissions grew 146% to 9500 tons or 27% of the world total; conversely US CO2 emissions shrank by 10% to 5900 tons or 17% of the world total. US CO2 emissions have and will continue to improve. China and developing economies are the problem. Further improvements in the US will have little impact on global situation. I also have issues with claims re the state of knowledge and uncertainty on the causality of CO2 being the predominant cause of global temperature, especially in light of the hiatus current and past. The state of scientific knowledge does not permit making such a conclusion; why IPCC formulate opinion (consensus) based measures dressed up as numbers such as 95%, which basically is a Delphi / show of hands type of opinion survey. As to your ‘Al Gore Wx’ event – I’m sure you’ve seen what’s going on out in the West right now. Sizable system. Think it might be headed east? This is a very good idea since it points out that the IPCC focus on the latter half of the 20th c. is not just a convenient round number choice, it is a cherry pick. It is the ONLY period before or after in which thier hypothesis seems to work. You should state what data you using for the scatter plot. I’m fairly sure it’s the 10 month running mean but you don’t say so explicitly. If you did it with the raw monthly data there should be some correlation due the annual cycle. The choice of 10 momth RM also seems rather odd and you don’t explain why you chose it. 10 mo will leave a residual of the annual cycle. Running means are crappy filters that distort the data and thus could be argued to have reduced any correlation that there may have been. I would suggest a triple running mean filter using 12,9 and 7 months in turn. I don’t think it will change you results significantly but would make them more robust to criticism. In fact there is negative correlation in fair amount of the record that is masked by Danley Wolfe’s straight lines. That makes the IPCC position even harder to maintain. If we select the portion of data with CO2 > 373 ppmv, which seems to be the point of inflection, there is a statistically significant negative slope. For there to be a significantly longer proportion of the data for which the slope is less than zero, it makes it difficult to conclude that CO2 is responsible for more than 50% of the change in temperature. If that was the case the slope would always be positive. LOL, you are replying to yourself. Anyway, if it only correlates on some decades and on some decades it does not correlate, then there is no causation. Can you imagine if gravity stopped working on weekends? the ice core CO2 proxy data are NOT directly comparable to data of measured CO2 in the air. Of course you can compare them. Any average in an ice core over a certain period can be compared to the same average of direct measurements in the atmosphere. There is not the slightest reason that ice cores or other proxies must have a 1-year resolution to be comparable with direct measurements. If the resolutions are different, all what one need to do is to compare the averages over the longest resolution time to the average of the direct measurements over the same time frame. If the weighted average gas age is known you can compare the results with the direct measurements at that time stamp. The latter is the case for ice cores gas bubbles. Ferdinand, I used the word “DIRECTLY” for a reason. Anything can be compared. I am objecting to your comparing ‘chalk’ and ‘cheese’ then pretending that ‘chalk’ IS ‘cheese’. But chalk is as different from cheese as direct atmospheric CO2 measurement data are different from ice core CO2 data. The first two charts are merely an overlay of CO2 and T. They do not show which came first, therefore they do not indicate a cause-and-effect. The evidence shows that ∆T is the cause of ∆CO2. That fact changes everything in the AGW debate. What about the past 17 years? ∆T has been zero, but ∆CO2 has been positive. Co2 will continue to rise as temperature cools due to lag time…in the same way it always has. It also continues to decline for a time once warming commences…as shown in ice core studies. Please note that I don’t know if temperature rise is the cause of recent CO2 rise. I am writing to answer your question. The evidence shows that ∆T is the cause of ∆CO2. CO2 follows temperature at all time scales. The ice cores indicate the longest lag is ~800 years. The Earth has been warming intermittently from the Little Ice Age (LIA) for centuries. If the past is any guide, then if cooling sets in there will not be a clear cessation of rising atmospheric CO2 concentration for some centuries. What recent (past 100 years) rise in ∆T caused the 40% increase in CO2 (from 280 —> 400 ppm) ? 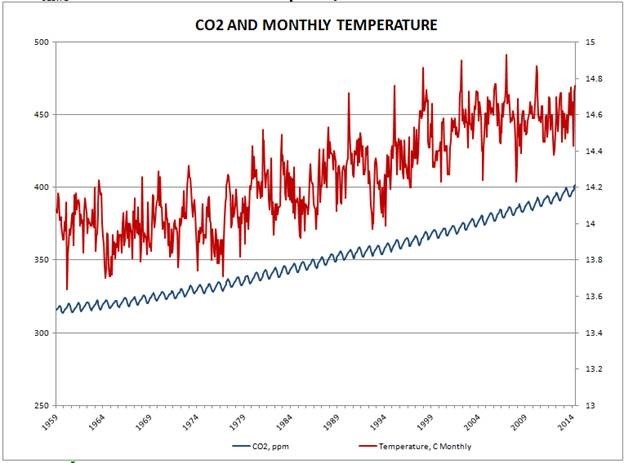 Your CO2 graph is a classic warmunist hockey stick. It stitches Mauna Loa data onto ice core data. This is grossly misleading because the temporal resolution of the two systems is different. The IPCC says the ice cores have a closure time of 83 years. This has the same effect as conducting an 83-year running mean on data from individual years. The Mauna Loa data is for individual years and cannot have 83-year smoothing because it only exists since 1958 (i.e. 55 years). You have compared apples and cucumbers then said something has changed because cucumbers are not round! Incidentally, the execrable Michael Mann was the first person I objected to having used this ‘splice apples to lemons’ trick and he made a veiled threat against me for pointing out what he had done. dbstealey, those interannual variations exist at all longer-term CO2 levels, no matter what man is or isn’t doing to the atmosphere. Richard, there is an overlap of ~20 years between the 10-years resolution of the Law Dome ice cores and the direct data from the South Pole. The ice cores overlap each other for longer and longer resolution, towards the far past. Thus in this case it is allowable to put the ice core and direct data together, but with a clear distinction in color for each of them. Actually, T is the cause of ∆CO2. there is an overlap of ~20 years between the 10-years resolution of the Law Dome ice cores and the direct data from the South Pole. The ice cores overlap each other for longer and longer resolution, towards the far past. It is always permissible to plot two different things on the same graph when each thing is clearly identified (for example, by plotting them as different colours). Indeed, this is often done to show difference(s) between them. That is NOT what is done in the fallacious graph posted by beckleybud@gmail.com. Firstly, the two different sets of data are presented as being the same thing (which, as I said, was Mann’s very first ‘Nature trick’). There is no distinction between the two in the presented graph. Secondly, ice core CO2 data and atmospheric CO2 data are very different. There is no smoothing of atmospheric data which is annual data, but the ice core data are averages over several years. Hence, high values of CO2 are reduced by smoothing in the ice core data but not the atmospheric data. Importantly, “high” values are deliberately deleted from the ice core data on the assumption that they are “artifacts of biological contamination”. Neftel published atmospheric CO2 values higher than 400 ppmv as ice core data prior to this practice of deleting ‘high’ values. But data are not deleted from atmospheric CO2 data when they are “too high”. The ice core data are adjusted to obtain the overlap which you mention. This is to overcome the ‘ice age/gas age’ difference in the ice, and this difference would not exist if the ice acted as sample bottles for the air trapped by the ice. In summation, the graph posted by beckleybud@gmail.com is a gross misrepresentation and colour-coding its parts would not be sufficient to correct the misrepresentation. The average of between 10-20 years over that time span is the same for the ice cores as for the direct measurements in the atmosphere, if you take into account the weighted average age of the air composition. The “high” values in several samples of the Neftel Siple Dome ice core were all from contamination via drilling fluid: several samples of the same part of the ice core show a large variability, including the “normal” low values in line with values of values of depths above and below the contamination. A later drilling at Siple Dome didn’t show high values. I know you like to pretend – especially to yourself – that the ice core proxy data for atmospheric CO2 are directly comparable to measurements of CO2 in the air. They are not. I don’t intend to go through all the various differences yet again but I will mention one. Before I do that, I point out that because the ice core data can be adjusted to overlap the real measurement data only demonstrates that it can be made to fit. ‘High’ values are deleted from the ice core data. The originally stated reason for this is an assumption that the “high” values are caused by biological contamination of the ice. This was always iffy: if biota grew then they consumed CO2 so removing the high values reduced the CO2 indication from the adjacent and still reported region. So what? The absence of high values in that core does not indicate what was – or was not – the cause of “high” values in the other core. You deny it was high atmospheric CO2 when the ice solidified. Whatever the cause of “high” values, there is no justification for deleting them and by deleting them it becomes possible to adjust the ice core data to overlap the measured data. I am surprised no one has mentioned the paper by Beenstock, Reingewertz and Paldor (Earth Syst. Dynam., 3, 173–188, 2012) that used Granger’s cointegration test for nonstationary time series (i.e., test of causality by leading/lagging variables) to formally quantify the conclusion over millennial periods changes in temperature have consistently led CO2 changes. The paper received a lot of criticism from the left side however as I understand the cointegration test it is actually quite noncontroversial. And at one point Richard Tol made statements to the effect that Beenstock is the only actual test of causality that has been done – for which he too was lambasted by the left. This chart covers the past 17 years, and it shows unequivocally that ∆T is the cause of CO2. T is never zero; there are always anomalies. CO2 follows temperature. You should read the WUWT archives for at least several weeks before commenting. I suggest using the search box, keyword: CO2. You will learn a lot if you do that. CO2 follows temperature at all time scales. Once you accept that fact, the entire “carbon” premise falls apart. The [natural] rise in global temperature causes CO2 to follow. But there is no empirical evidence showing that ∆CO2 is the cause of ∆T. Thus, the CO2=CAGW conjecture is deconstructed. If you drive at around 50 km/h and suddenly your odometer shows values between rapidly varying between 45 and 95 km/h, then you can’t say that the high values are valid, for the simple reason that your car doesn’t change that fast in speed. If the ice core values for the same part of the ice core show large scattering and small parts of it show the lowest values and contamination with drilling fluid is observed, there is good reason to reject the high values. As far as I know, nobody used biological contamination as excuse. If the ice core gas age weighted average can be determined, then there is no reason to not compare them to the direct measurements. But even if you don’t, there is a clear hockeystick without precedence in the ice core data up to 1980. All what your chart shows is that the delta T causes the delta CO2 around the trend, but that says next to nothing about the cause of the trend itself. The CO2 trend is not caused by a change in temperature, as the temperature didn’t change over the past 17 years. Bart thinks that a sustained change in temperature does give a sustained increase of CO2 in the atmosphere, but that violates Henry’s law, as the sinks increase with the increase in the atmosphere, thus at constant temperature, the increase in the atmosphere must asymptote to a fixed increase in the atmosphere, not a fixed influx or outflux. You know that I respect your views. But anyone looking at the last chart I posted above can see that changes in CO2 follow changes in temperature. You may not agreed that T causes ∆CO2. But I don’t understand how you cannot see the clear cause and effect there. Please don’t worry about the delay. That is understood. You have ignored that as you have also ignored the main point from dbstealey which concerned coherence of CO2 and temperature. Please try to give as much consideration to evidence which refutes your arguments as you do to evidence which supports your arguments. This chart shows that total CO2 increases without any increase of T over the past 18 years. My answer is here. And I. too, don’t know if this message will appear in the right place with this daft nested system. Fig. 4: The time interval of 15 years is too small, because the global temperature is the result of many forcing mechanisms, for instance the natural variability. A time interval of 60 years would be more convincing. The ocean acidification meme is stifling in its monotone. It is designed to sound scary. No other purpose. When CO₂ is the better part of CaCO₃, It is hard to escape its eventual inclusion in carbonate minerals. Try to tell that basic carbon chemistry to morons. It doesn’t work. “Acidification” at pH 8.2 to 8.1 sounds scary. Unless you know anything. I agree. The natural variation of ocean pH is 7.6-8.4 as an overall average. Isolated places can have low pH levels, ie. acidic. but local moluscs seen to ignore this and extrude a mucus layer to survive. This is natural. Divergent zones at the ocean ridges have a pH of below 4.5 but moluscs thrive. They survive the extreme heat here as well. Junior high school science answer: the system is out of equilibrium due to the massive rapid and accelerating addition of fossil CO2 to the atmosphere. Whatever the reason, the carbon cycle system is always moving towards an equilibrium which it never achieves because the equilibrium value varies. For example, it is often asserted that increased atmospheric CO2 would induce a change to dissolved CO2 (i.e. so-called ‘ocean acidification’) as the equilibrium of CO2 concentrations between air and ocean adjusted. Of course, the opposite is also true. If ocean surface layer pH has changed by a 0.1 (which is far too small for it to be detected) then that would have resulted in all the rise in atmospheric CO2 concentration since the industrial revolution. Richard, I was replying to Willhelm who seemed to think he could stump climate scientists with his question, or that it showed that they were ignoring something obvious. But what’s your point? Are you suggesting that something else could have raised the pH of the entire world oceans and that his is cause of rising atmospheric CO2, not human emissions? Are you suggesting that something else could have raised the pH of the entire world oceans and that his is cause of rising atmospheric CO2, not human emissions? I am not “suggesting” anything happened. I am pointing out that there are many possibilities other than human activities for the observed rise in atmospheric CO2 concentration. One such possibility is a change to ocean pH of undetectably small 0.1 in regions of net oceanic emission. Such a reduction in pH could have happened as a result of increased sulphur being injected into the oceans by undersea volcanoes centuries ago. Transported by the thermohaline circulation for centuries it would eventually reach ocean surface layer, and the carbonate buffer would not inhibit its effect on the pH of the ocean surface layer. To apply fallacious warmunist logic, can you prove volcanoes didn’t do it? I don’t know if the recent rise ion atmospheric CO2 concentration has an anthropogenic cause or a natural cause in whole or in part. Just a brief introduction, I have been following the climate change debate for, oh, about six weeks! As I am finding with regularity, when people like me, with no scientific background of any kind whatsoever, develop even a slight interest in digging deeper, the warnings we have been given for the last number of years about the path we are on seem to fail to stand up to even mild rigour. So that’s how I recently found Watt’s Up With That and I have thoroughly enjoyed the posts I’ve gone through so far, even if some of it is above my head and the whole subject rather intimidating owing to tremendous complexity. So, the first of what may be a series of silly questions as I find my way into these fascinating subjects! – Is it possible that different types of CO2 could have different effects on temperature? For instance, can scientists discern CO2 which is up there due to natural process and that which man has created? Could it be that, say, Type A CO2 does not cause warming but Type B CO2 might? Or is it simply the case that all CO2 up there is the exact same substance with the same effects (or lack of) on its surroundings? Thanks all and it’s a pleasure to be reading. Pedants will point to the fact that there are different isotopes of carbon but that is not relevant in terms of your question. In the context you state, the answer to your question is that “all CO2 up there is the exact same substance with the same effects (or lack of) on its surroundings”. This is because no molecule remembers how it was formed and by what. Please remember that there are no stupid questions but there are stupid answers. Honest people ask questions in hope of obtaining an honest answer. Trolls ask questions to disrupt debate. A good question can engender a variety of answers. Welcome to the site, and keep asking questions! If I may suggest: try asking the exact same question at the Skeptical Science blog. Thanks to both of you for the welcome and the answer. I may just take up your suggestion. As I am finding with regularity, when people like me, with no scientific background of any kind whatsoever, develop even a slight interest in digging deeper, the warnings we have been given for the last number of years about the path we are on seem to fail to stand up to even mild rigour. In my mind, that’s WUWT’s strength. While some other exceeding valuable blogs have a more technical take on things, WUWT excels as being the best site for people looking to learn more than what they hear on the news or the lunch table at work. A lot of that is by design – Anthony was a TV meteorologist and part of that job is to put on something that is accurate and appeals to the most people. That background more than anything else is why WUWT is so successful. I have fond memories of my first visit to WUWT. I, too, had just decided I needed to “learn more about global warming as it must be important.” Asked a couple of reasonable questions at a Warmist blog or two, and got ridicule and derision in return. One said something like “that’s the stupid stuff they push at WUWT”. So I went looking for what WUWT was 😉 (I had asked a science based question where my background caused me to doubt one of the AGW Talking Points… just a reasonable “But what about this …”. At WUWT, I found rational discussion with only the occasional name calling (and that often quashed by moderators in short order). I also found that my Science training was accurate, that others asked the same questions, and that folks here often gave warm and clear answers. Over time, I moved from “Golly, Global Warming must be bad” over to “Golly, it’s not bad, mostly good, isn’t much of it anyway, and the data are ‘cooked’ for political effects.” It is an interesting journey, and yes, complicated science along with, IMHO, ‘willfull distraction’ (aka deception) on the Warmers side / sites. But worth the effort. On the question of “different kinds of CO2”: No, not really. Any physical / chemical action will be substantially uniform no matter the source. The biggest thing, though, is just that nobody really know how much CO2 comes from where, or goes to where. It’s a patchwork of guesses in many cases. In short, not just the CO2 in the air, but that in the oceans as well, is subject to gigantic natural changes, and huge errors in measurment. Oh, and people are a small gnat on that giant pile of carbonate rock all over the world. I am also a non-scientist but, at the risk of sounding stubid, I’ll share what I know. Normal CO2 molecules contain a carbon-12 atom. Let’s call this “light” CO2. A small percentage of CO2 molecules contain a carbon-13 atom, which has an extra neutron. This is “heavy” Co2, since it actually weighs more. Other than that, their chemical properties and effects are the same. Heavy CO2 (a) decays into light CO2 over time, and (b) being heavier, tends to fall into the soil or water sooner. So an elevated percentage of heavy CO2 suggest that it is of recent origin. But it is nearly impossible to find data on what the ratio of heavy to light actually is; and harder still to find solid evidence, or even an opinion, of what the ideal ratio should be. woops. After posting, I realized that carbon-13 is a stable isotope, so it doesn’t decay into carbon-12. What the AGW people will tell you is the release of burning fuels is that they were buried and therefore have less carbon isotopes. co2 released from burning wood for example, contain more isotopes due to being exposed to cosmic and x-rays at the surface. From that they estimate the percentage of natural co2 and man made. Depends on who you talk to in the AGW crowd. On the one hand, the oceans are absorbing co2, then on the other releasing it. Depending on which argument you present to them. A colder ocean absorbs more co2 or not? Or does a warming ocean release more co2? And if it does, then does that upset the percentage of natural versus man made co2? I’m going with, if I don’t know, neither do they. I’m going with the statement made here earlier that various parts of the oceans are either more base or acid at different times. And if something happened centuries ago, it would only be showing up now. Bottom dwelling water takes centuries to get from the poles to the equator. So what are they saying exactly? Soil contains ten times the amount of co2 as does the atmosphere. Again, depending on the argument, either the co2 is mixed evenly in the atmosphere or there are areas where co2 levels are higher and lower. So in one argument, it was pointed out that some parts of the rural west had much greater levels of co2 than say some heavily populated areas of the northeast. If that’s true, I don’t know how much co2 is being released into the atmosphere from farming. The certainty issue is what I find upsetting. They’ve raised a lot more questions than answered. I’ve generally moved on from this area of inquiry simply because there are way to many unknowns, and too many people claiming they know. I find it a better use of time to refute AGW regardless of where the co2 comes from or who is responsible. Of course that doesn’t stop AGW from claiming the ocean is eating my heat. Or the ratio of the amount of fossil fuels burned, the amount of increase in the atmosphere, and the amount that disappears into the ocean. The oceans are getting warmer and absorbing more co2? I am also a non-scientist and have been following WUWT regularly for about one year. My major concern is trying to convince my family and friends about the global warming hoax – namely that increasing anthropogenic CO2 is causing global warming, global climate change and/or global climate disruption. Almost daily I read an article in my local newspaper talking about the devastation that will occur if mankind continues to burn fossil fuels and thus increase the CO2 in the atmosphere. I have not read once where this is a proven fact – but the media apparently doesn’t care about facts. As I read the excellent posts on WUWT I learn more every day. My question is, are we making any progress in educating the public or are we just singing to the choir. I often send emails to the writers of these fallacious articles or send a “letter to the editor”. Being a non-scientist I am not certain my arguments carry much weight. Other than CFACT what should all of us “deniers” (I hate that term) be doing to get the real facts out to the public so we can turn the tide of the propagandists? My question is, are we making any progress in educating the public or are we just singing to the choir. The rate of progress can be debated but progress is being made and this sequence of posts in this thread demonstrates it. UNWMO contradicts the UNIPCC SREX. Does this mean that the UNIPCC SREX is now refuted, discarded, obsolete? Has the UNIPCC lost its authority? Is the UNWMO now in charge of climate science? Can we dissolve the UNIPCC now, and fire the climate scientists? No it means that either Michel Jarraud speaking as head of UNWMO is totally ignorant of the subject or is wilfully misleading the public. In either case he should resign. As head of WMO, surely Dr. Jarraud has evidence of the weather becoming more extreme. May we see it? I read this release the other day in the french newspapers and was so disgusted stopped 1/3 of the way through. The french academie ruled against Allegre and Courtillot about 2 yrs ago saying that AGW was real and dangerous and ever since the press here has been getting more and more excited. Most of the french population are scared witless of AGW and believe everything they are told. Have you talked to someone who knows about the French Revolution and why it happened? At least the French people I know were the first to state, at least privately, AGW is, politely put, mistaken. Stephen, the French press is as controlled, and lying, as any EU press. The rise in CO2 follows the rise in temperature. This is evident on all time scales, from years to hundreds of millennia. There is a mountain of empirical evidence that proves ∆T is the CAUSE of ∆CO2. But there is NO evidence showing that ∆CO2 causes ∆T. Also, anthropogenic global warming [AGW] is not a ‘theory’, it is only a conjecture; an opinion. To be a theory, AGW would have to be able to make repeated, accurate predictions. It cannot do that. The AGW model was not even able to predict the most significant event of the past two decades: the fact that global warming stopped in the late 1990’s. What are your conclusions, Dr Jarraud? The only rational conclusion is that the AGW conjecture is wrong. CO2 may cause some minuscule warming. But it is so negligible that it cannot even be measured. There are no verifiable empirical measurements showing that human-emitted CO2 causes global warming. Every fact asserted in this comment is verifiable. The scientific evidence and observations have been posted here numerous times. Again, Dr Jarraud: what are your conclusions? AGW is never going to admit that they are wrong. No matter what the weather event is, it’s AGW. The world climate was perfectly flat before AGW. 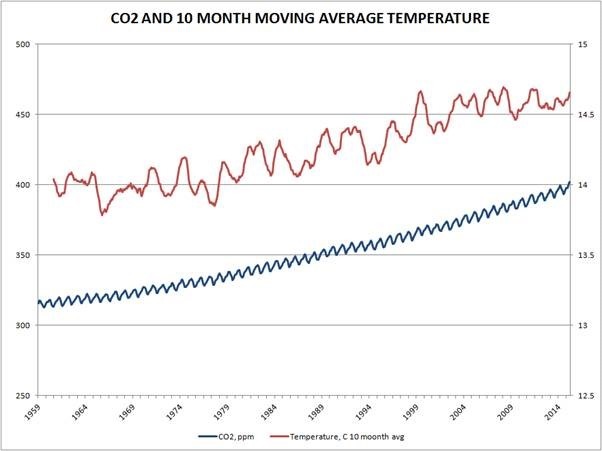 I refer you to the graph with co2 and temperatures over very long time periods. “What pops out there?” AGW will never say that it is wrong. I agree with you db… One other thought you might ask in debating this is, if co2 were much higher in the past, certainty past the tipping point, why didn’t the planet go into a point of no return then? I think the author has mixed up the estimated slope for the last 15 years (0.000351) with the standard error (0.001086). The latter number was used to calculate the “sensitivity”. A relevant figure to note would be the upper CI, at 0.0025. This would give a slope equivalent to about 1C/doubling. But none of this has anything to do with the equilibrium sensitivity, which are the IPCC numbers that he quotes. Even TCS, acknowledged to be lower, is an increase over 70 years. No scientists expect to find a meaningful sensitivity over fifteen years. There are huge lags – it’s just the wrong time scale. Are you asserting “it’s just the wrong time scale” as excuse #53 for “the pause!? No. It has nothing to do with the cause of the pause. The impulse response , according to the Bern model, is here. It decays over many decades. No scientist expects a relation between an instantaneous change in CO2 and temperature. That’s why even “transient” CS has an interval of 70 years. (b) you now say you had intended to talk about the (ridiculous) Bern model of the carbon cycle which is about how CO2 enters and leaves the air. It would help if when you make assertions you were to say what you are talking about instead of claiming your assertion is about something else. Based on what many scientists have actually said, you may want to reconsider your claim. Or are you offering a corollary sort of excuse for the pause along the lines of “no scientist ever said there would no be a pause” ? So according to that line of argument , there would be several decades lag of temperature after CO2 rise. Since the rise in CO2 is monotonic and steadily in one direction, we should be temperature rise due to CO2 lagging CO2 by about 20years. The rise in CO2 in 80s and 90s should be evidentially in full swing from around y2k but we see it is flat. Are you suggesting that if the CO2 data is lagged by some period the correlation will become apparent? True, the time scales of the Bern model are an analogy only. But no theory says that temperature will respond to CO2 instantly and proportionately. Nick says…But no theory says that temperature will respond to CO2 instantly and proportionately. Proportionately? So are you saying all the claimed “climate sensitivity” numbers are meaningless? As already pointed out, we are well into the time frame where the feedbacks pushing CS beyond the direct affects (which are supposedly instant BTW.) should be in full swing, but the are notably absent. No. The consensus is that there are multiple timescales. However, Schwartz has controversially tried to get a single time scale and came up with 8.5 years. Most think that there are much longer scales. But even 8.5 years means that you can’t get anything out of a signal/response analysis of 15 years. Yet, is not the response of 15 years a follow up to almost 50 years, so the feedbacks should be well in play? Are you asserting “it’s just the wrong time scale” as excuse #53 for “the pause”? But even 8.5 years means that you can’t get anything out of a signal/response analysis of 15 years. “It’s just the wrong time scale” is excuse #53 for “the pause”. Sorry, Nick, yours is one of the silliest of the excuses. No. They have a well-defined meaning. Equilibrium Climate Sensitivity is the rise when the effects of a CO2 doubling have reached equilibrium. That is expected to take centuries. Transient Climate Response is the response to a 1% per year rise in CO2 over 70 years. None of those have any connection to what is calculated in this post. You are completely off the beam. Neither this post nor my response has anything to do with “excuses” for the pause. It’s about how, if at all, you can calculate climate sensitivity from correlation of temperature and CO2. But I explain your phrase for any onlookers who may not know. In WW2 Luftwaffe bombers would follow radio ‘beams’ (i.e. signals) directed over their target. This method enabled direct navigation at altitude to their targets. The British spent much effort (known as ‘beam bending’) to disrupt the ‘beams’ with the intention of getting the bombers to drop their bombs in the wrong places. A bomber which went off-beam would miss its target. And this is what Nick claims I have done. Really? So none of the feedbacks are operative within the last 15 years? Please provide a published journal stating this. It is however curious that Nick is now asserting that it may not be possible to find a real world relationship between temperature and CO2. “it’s just the wrong time scale” as excuse #53 for “the pause”? But he fails to see that conclusion from his claim and he says I ‘missed the target’. Richard, that indeed is the essence of his claim. I guess he knows more then all the vaunted climate models which contain the most amazing physics known to man. I guess he knows more than all the vaunted climate models which claim to contain the most amazing physics known to man. I guess he knows more than all the vaunted climate models which might contain some approximations of part the most amazing physics that man thinks he knows enough about to begin approximating partial computer models containing some of the constants and a few of the variables. No, I’m saying, as scientists know well, that you can’t find an instantaneous relation. That’s why sensitivity is defined as it is. But it’s odd, looking down the thread, that no-one seems interested in my initial observation that he has simply mixed up his numbers and used the wrong one (se) to calculate sensitivity. Or noticed themselves. No. It is not “odd”. You made a daft assertion and when ‘called’ on it you tried to waffle your way out of your error. Having seen you did that, several people asked you to say the nature, the mechanism and THE LENGTH of the delay of warming after CO2 rise which you assert. But you have not replied to these requests. Instead, you now claim “it is odd” that people have not responded to what you assert was your “initial observation” which is akin to your shouting, “Look over there, a squirrel”. No, Nick. It is not odd that people are not looking at your ‘squirrel’. Answer the plain questions put to you about your real “initial observation” and – after that – we will look at your ‘squirrel’. Sorry, mods. If I comment now with my regural WordPress account, the comments just disappear. It said I could use my Twitter account, so I tried that. What is the right time scale? and when that passes will you admit that theory is wrong and you with it? The TCS and ECS from GHG effects are a few yrs at most. Downwelling IR from CO2 can’t penetrate the ocean beyond the skin-layer, so “warming” from it manifests almost immediately as SST and added water vapor. No significant heat-storage. I would say that Beenstock and Reingewertz’ analysis rules that possibility out; but if it were so, why then would we have to reduce CO2 emissions now? You just said that we’re finished anyway. Because our CO2 emissions from the 1970s (or whatever decade fits your bill) will finish us off. So Global Warming becomes the unstoppable Apocalypse. Great – that means we have several decades to leave the planet. So lets build a spaceship fleet right away! Shouldn’t that then be the demand of the IPCC ? The whole notion of “climate sensitivity” as a static gain rests upon a presumed LINEAR relationship between CO2 and temperature levels. That notion is contradicted by the patently NON-LINEAR relationship shown by the present–and much other–data. Hand-waving appeals to “huge lags” and CO2 residence-time “impulse responses” are simply red herrings that distract attention away from the empirical evidence indicating that the Mauna Loa CO2 signal lacks the requisite phase-LEAD and cross-spectral coherence to be a credible driver of GAT. This correction further reduces the calculated sensitivity for this data set from 0.4 to 0.1 deg C. This does not change the conclusion that for data in this period statistically the correlation is not different from zero. Using the Lower Tropospheric satellite temperature data from Dr Roy Spencer’s Web site, December 1978 to August 2014, and the monthly CO2 concentration from Mau Loa Observatory gives a correlation coefficient of + 0.087 between the global averaged temperature and the CO2 concentration. However, taking the averaged temperature data for the Equatorial Zone, 20 deg S to 20 deg N latitude, gives a correlation coefficient of – 0.007 – go figure! One would expect the Equatorial Zone would be more relevant than the global averaged temperature. Either way the results certainly do not point to any urgent need to eliminate CO2 emissions. Notice that none of the climate crisis promoter claims regarding so-called ocean acidification show any pH numbers. The acidity of the ocean is represented by its pH measurement. There are no reports of pH changing in any significant way. Much less in a dangerous way. That lack of statistical reporting is deliberate by the crisis reporters. There are no honest measurements available that have shown any sort of decrease in pH to support the ocean acidification claim. Like every claim of doom made by the climate crisis promotion industry, the so-called ocean acidification claim is false. That is for three reasons, each sufficient to refute totally the warmunist alarm. 1. There are only recent measurements, and those are limited to about 0.1 pH accuracy. 2. pH varies diurnally, seasonally, and by location since strongly influenced by biological activity. 3. The ocean is a highly buffered carbonate system. AR5 finally recognized this while AR4 got it wrong. AR5s worst (impossible) RCP 8.5, according to them, only results in a decline of 0.15- 0.2 pH in the mixed layer. There is a 7.7 to 8.1 pHchange within the mixed layer from below the euphoric zone to the surface. All biologically driven. The whole ocean acidification thing remains Warmunist Lysenkoism. And some of the papers behind it border on scientific misconduct. Wrote an essay on this for the upcoming book. You can read a portion over at Climate Etc. Shell Games. pH varies largely based on the amount of sunshine and plant action in the ocean. Daily / seasonal ranges can be large as the plankton blooms / dies (or just does photosynthesis / respiration). This means you will end up with a basket of numbers from which cherry picking and ‘homogenizing’ can be applied to make all sorts of bogus ‘trends’. Oh, and they conveniently ignore the giga-tons of ‘manganese nodules’ on the ocean floor. These are full of all sorts of metals, not just manganese. Any attempt to actually reach an acid pH will run smack into a giant reaction wall forming precipitated carbonate rocks and various metalic reactions. Up to pH of 4.5 for fresh water clams…. Oh, another interesting observation was when I was trying to get the pool to be alkaline… What do you add to do that? Umm… carbonate…. What do they sell to make a pool more ALKALINE? To RAISE the pH from acid to basic? Sodium Hydrogen Carbonate or Sodium Carbonate. Baking Soda and “Washing Soda”. This stuff is sodium with a carbonic acid group (i.e. CO2 hydrated) or two stuck on it. To make the pool more alkaline, you dump in loads of CO2. Now think back about all those metals on the ocean bottm. Metal + CO2 + water and you get metal carbonates… and an alkalinizing (making more basic in most cases) effect. Metals make strong bases, and carbonate makes a weak acid. The net result is basic salts. Looking at the NASA GISS global mean (absolute) land temperatures, it appears that the cooling going into the mid 1970, of which there are dozens of newspaper articles from around the world, has disappeared. Is this an artifact of adjustments, or is the fact that this is land only, and why use land only, since it is more likely affected by UHI bias? This scare was endorsed by every major climate organization, including NCAR, CRU, NAS, NASA, and the CIA. The rulers of climate are disappearing our history, as they have with their integrity and ethics and honesty. it appears so, but I would like the author and anyone else to respond to this question. Why use land only, and what happened to the cooling until the mid 1970s? 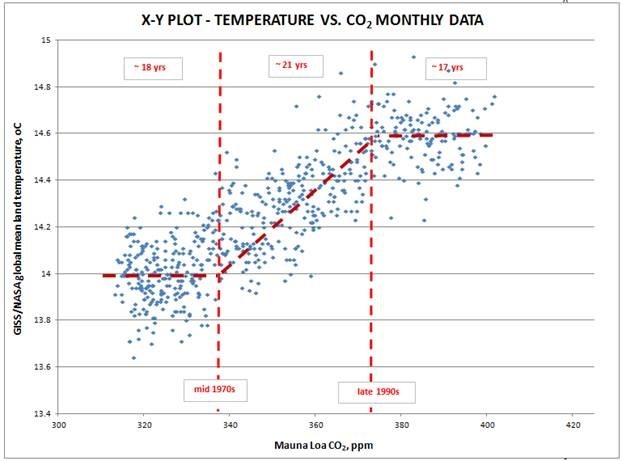 I find the red lines on the x-y plot (CO2 vs temp monthly) plot to be a distraction. Also, it might be interesting with the time vs CO2 and temp graphs, to use logT instead. There’s no sense in a log plot, since it is already fairly linear, a log would just flatten it and you’d see nothing. Using the GISS temperature data is a complete waste of time any way, I know posters want to use their data against them. But just look at that top Graph, where is the distinct Cooling that took place in the 70s, which falsified CO2 causing warming. It has been removed by the “Quality Adjustments”, History re-written to fit the dialogue. What huge lags Nick? Either CO2 is slowing down the time IR is in the atmosphere or it isn’t. The lag time is short. Or don’t you believe in the GHE? That should read increasing the time IR takes to travel through the atmosphere. It’s more to do with the time it takes for the oceans to warm, but no amount of lagging will make it match any better than what is shown. Global warming is claimed to happening “here and now” because of emissions since 1960s. It’s also claimed to be the “dominant” factor and responsible for more than 50% of the changes, yet it gets over powered by other factors and we see there is a negative correlation even after all the “data correction” and homogenisation” that has been done on this temperature data. Even more interesting, add in the previous 50 to 100 years. You can see temperatures bouncing all over the place with no change in CO2. Richard catches Stoke’s errors on many occasions, but today’s was one of my favorites. Normally one would suspect that the biggest stupidity would come from some commenter with no training or background in science at all, and yet there is Stokes making all the laymen look good day after day. I still feel good about the day that Nick’s best argument to me was to tell me to go read the Sunday comics. It made me feel like I had ‘arrived’. Or at least like I had hit a nerve. No, what is missing is Trenberth’s heat, and – if you don’t know – that is a travesty. So all you can reply with is yet another ad hominem attack on a climate scientist? Please explain to me why the increasing heat content of the oceans is not a sign of global warming, and why we can’t expect this to lead to continued warming of the lower troposphere in the future? I made no ad hom. I cited what was actually “missing” as refutation of your silly assertion that the thread should be side-tracked by your completely irrelevant ‘red herring’ of “ocean heat”. You made a good try at at flaming though. Now please retire to your bridge. Citing trenberth’s own words is an ad hominem? Maybe you just don’t know what an ad hominem is. Hint, it is not quoting someone. There have also been pauses followed by large DROPS in temperature. Just need to look at longer time scales. BTW, I endorse Nick Stokes claim that the time scale is wrong. Look at 10,000 years and it is very clear we are in a long cooling trend with a 1500 year ‘wiggle’ with about 700, 350, and 100 ish year ‘wiggles’ on that, with about a 50-60 year PDO cycle. Any given 30 year period can be rising (on a longer secular rise) or falling (again on a longer secular fall). Right now, the longer term cycles are set for a downturn, as is the 60 year PDO / AMO set. One would naturally expect a long ‘pause’ as those various cycle tops slow, halt, and begin their down run. Plot a 1500 year ( or even a 350 year) SIN or COS wave and look how long the ‘flat’ inflections take. So yes, Nick is right. NONE of our instrumental temperature record is of the right time scale. All of AGW based on it is bogus. The CO2 Red Herring is because they have the wrong time scale and can’t see the regular cycles on cycles, so make mistaken attribution. Until they have explained the 1500 year Bond Event cycle, and the 60 Year PDO cycle, and the vairous other cycles and included them in their graphs and calculations they are just dancing in the error bands of stupid averages. Sorry, a bit of a problem with your first curve. You forgot to plot them to absolute scale, and side by side instead of as some sort of “anomalies” with different reference points on the scale. They are completely different quantities, with different units, after all. If you MUST plot them on the same figure as anomalies, at the very least normalize the anomalies by the reference temperature/concentration they are anomalies OF, and line up the starting points. Seriously, both of these graphs would make your point far better than anything you imagine. I’ve built both of the on WFT, just for grins. Temperature on an absolute scale (which you have to construct by adding e.g. 288K to the anomaly of your choice) looks pretty much like a straight, flat, line. CO_2, OTOH, as they say has increased by around 75 ppm over the same time period. If you build the relative (percent change) graph, it is even more powerful. 0.5/288 = .17% — it is a straight line absolutely indistinguishable from zero (statistically indistinguishable when one factors in the probable error both in the data and in the number 288). 75/325 = 23%, with negligible probable error. One day it would be useful to do a study titled “Quantifying probable error in climate science”. Every number presented is presented as if it has an infinite number of significant digits. No number is ever presented (in graphs, at least) with actual error bars computed using a reproducible, defensible, methodology. As a consequence all results appear to be “certain” in spite of the fact that HADCRUT4 and GISS differ by several tenths of a degree and that is only two non-independent samples of global temperature anomaly model computations intended to produce the measure being studied. HADCRUT4 acknowledges 0.15C IIRC — although it is omitted in the graphs, of course — in the most recent past, although I suspect that this is an egregious underestimate based merely on the spread of the alternative models, and that doesn’t account for possible systematic errors and biases in those models and — I suspect — doesn’t correctly account for kriging errors and the sparsity of the sampling compared to global surface area. Or maybe it does, I don’t know. Splicing, infilling, kriging over a big gap — all of this costs certainty. Things like UHI are bias and cost certainty. My intuition is that it would be difficult to measure either the mean temperature or the mean temperature anomaly on a single square kilometer of the Earth’s surface around my house, with a network of thermometers non-uniformly spaced and often stuck above people’s driveways (to emulate UHI corruption relative to the temperature of the green-tree countryside surrounding those houses and driveways and roadways). This makes it a bit difficult for me to believe that they accomplish it with similarly UHI corrupted surface records, including a huge number of apples-to-oranges measured numbers (just how DO you measure “surface temperature” on the ocean, where the sea surface and air temperature just above are often entirely different?) and where 70% of the Earth’s surface is measured to the extent that it is measured by a paltry network of a few thousand drifting and fixed buoys. In science, it is far worse to claim “marginal” knowledge at a certainty that is not justified by the data than to acknowledge that the data is not yet sufficient to provide much reliable knowledge. It is a tragedy of our funding model that we do not equally reward null results and non-null results in science, as the former are often more valuable than the latter, if published. They form important boundaries on speculation and “keep it real”. By tying the livelihood of researchers and scientists worldwide to success, we have created a world where researchers regularly have to choose between publishing a marginal result in the most favorable light possible and stay on track for tenure, keep their job, have a chance at more funding, remain employed in scientific research or publishing a null result and watch funding disappear, tenure vanish (who quotes a null result paper? Tenure decisions are now largely based on internet-generated counts of paper crossreference!) and find themselves, Ph.D. in hand, teaching high school students or selling cars while living at home in their old bedroom. And it is especially simple to do in a field where literally everybody is doing it! It will be very interesting to see if there is any sort of backlash at all as papers emerge that modulate the exorbitant warming claims of the original IPCC models to ever lower, less alarming levels as they are forced down by the data, by Nature doing something quite different than what the models predicted. We’re already starting to see this happen. At some point the “certainty” with which earlier results were stated will very likely be called into question as it becomes even clearer than it already is that those “certain” results were nothing of the kind, and were not in fact even close to the actual result as it evolved. I find the interesting question is why the intellectual dynamic (starting circa the early 1980s) of the AGW focused part of climate science first presumed alarm and dutifully modeled to show alarm instead of first being circumspect and realistic about what the AGW component of climate was. Why? I have my argument as to why, but it should be a philosophy of science concern to explain why. Grant Proposal A: Carbon Dioxide is a well-known greenhouse gas whose concentration in the atmosphere is predicted to increase the Earth’s average temperature by approximately 1 C upon a doubling from pre-industrial levels expected sometime in the 21st century. The anthropogenic fraction of increasing carbon dioxide levels is unknown, but may be significant in the future, if not now. Support is requested to improve our understanding of atmospheric chemistry and how it modulates the atmospheric radiative effect that is responsible for both warming and cooling our planet as greenhouse gas levels and atmospheric albedo vary in response to both natural and anthropogenic activity. Grant Proposal B: Carbon Dioxide is a well-known greenhouse gas whose concentration in the atmosphere is predicted to double from pre-industrial levels sometime in the 21st century due to human activity. The additional carbon dioxide in the atmosphere could, through postulated positive feedback from water vapor and other greenhouse gases, cause a total increase in the Earth’s average temperature by over 5 C. An increase of this magnitude would have enormous impact on the biosphere, causing the major ice sheets to rapidly melt and sea levels to rise by as much as five meters. The increased heat in the oceans may well trigger devastating superstorms and cause both flood and drought worldwide. Support is requested to study these possibilities and determine how we as a species can survive the fouling of our own atmosphere with carbon dioxide. Proposal A might well get funded, at a moderate level, with a few centers around the world engaged in similar research. Proposal B doesn’t just get “funded”, it becomes an entity sufficient unto itself with billions of dollars dumped into studying the question at all levels, with presidents and congress and world leaders panicking and the major energy companies laughing up their sleeves as all of the furor needlessly doubles energy prices — and their profits — without having the slightest impact on demand or the growing need for energy. Proposal B was directly presented not to the NSF or the DOE, but to the congress of the United States by James Hansen, the head of NASA GISS. To make sure that the congressmen who were listening properly appreciated his message he conspired with certain Congressional leaders to turn off the air conditioning in the Capitol Building in the sweltering Washington climate, so that temperatures soared indoors during his talk. When Proposal B encountered resistance not from Congress but from other climate scientists, an unknown scientist who had written his own PCA code for determining past temperatures from tree rings and ended up with a curve that showed the Earth’s temperatures being flat right up to the industrial era and rocketing up only at the end was found, and his graph — that contradicted many, many graphs being presented at the international meeting involved — was made the cover art for the Assessment Report. Proposal A never stood a chance. AR5 actually says the range is 1.5C to 4.5C per doubling (not 2C to 4.5C). If there is long term (eg a 60 year cycle) variation in the trend due to natural causes, then evaluating sensitivity to GHG forcing should consider a period at least that long. It is perfectly reasonable to compare warming to forcing over long periods to estimate sensitivity, but focusing on short periods is likely to mislead. This is principle error of the IPCC; they looked at the more rapid warming of ~1975 – 2000 and concluded sensitivity is high. They were mistaken to infer high sensitivity from a short period, and you are mistaken to infer low sensitivity from a short period. You should also remember that there are other GHGs which increase forcing, man made aerosols (which tend to reduce forcing), and ocean heat uptake which selays warming for a long time. Unfortunately, aerosols and ocean heat uptake are not accurately known at present or in the past, so there is no simple way to relate forcing and concurrent warming to climate sensitivity. That being said, the best emperical data suggest sensitivity near the low end of the AR5 range (work by Nic Lewis and others). My reference was mainly to the earlier IPCC estimates (through AR4), not just AR5, where the estimates of rapid warming in earlier AR’s were walked back somewhat. I think some historical perspective is called for here. The Charney report (July 1979) projected warming of 1.5C to 4.5C per doubling, based primarily on the very crude climate models available at that time (yes, the report says exactly that; see page 2, ‘Summary and Conclusions’). The measured rate of warming following the Charney report, at least through ~2000, appeared to confirm the crude model projections, and the CAGW movement was born. The error in all the early IPCC reports was to discount via an arm wave obviously conflicting data (why was there rapid warming from 1915 to 1945, then slight cooling from 1945 to 1975?) by invoking variable man-made and natural aerosol influence… without a shred of data to support that invocation. Once James Hansen testified to the US Congress in 1988, the climate hysteria was already becoming ‘locked in’ by people with huge vested interests in the model projections being right: climate scientists, neo-Malthusians, environmental groups, etc. The post 2000 data shows clearly that the model projections of rapid warming were most certainly NOT right, but there remain today huge vested interests in maintaining the plausibility of very high climate sensitivity…. so we see the recent barrage of published ‘explanations’… as we have already discussed at your blog. The climate modelers CONTINUE to use higher levels of aerosol offsets than the IPCC’s own aerosol group says is most likely, and higher levels of ocean heat uptake than the best available measurements. Were it not for these less than probable off-sets, the models’ projections of warming would be even HIGHER than CMIP5 projections. While we know for certain that rising GHGs have to cause warming, we should also recognize that high climate sensitivity was never justified by the weight of the data. It is not the first time people have misled themselves by not being sufficiently…. err…. skeptical, nor will it be the last. The climb-down from high climate sensitivity will be slow and difficult for climate science, but reality gives not a hoot about climate models, so the climb-down is pretty much inevitable. The sooner that happens, the better, since there are IMO legitimate long term energy supply issues which need to be rationally discussed. Those rational discussions are almost impossible so long as extreme projections of warming are being insisted upon by the ‘climate science community’. Well-said, Steve, and I think you are probably right. The issue is one and the same with the purported “split” between natural warming and anthropogenic warming. The fact of the matter is that we have “direct” theoretical justification, perhaps, for roughly 0.9 to 1.9 C of warming from a doubling of CO_2, and even this estimate could be high on the low side as it is very difficult in the extreme to really precisely account for things like line narrowing with temperature and pressure as one ascends a presumed constant lapse rate from a presumed uniform surface height and everything else kept equal, while accounting fully for path integration and energy transfer. Everything else in the computed climate sensitivity is feedbacks on this process (plus a smattering of “noise” from variations in other drivers that are usually treated on some sort of all-things-must-be-equal basis). The problem is that we really don’t understand the feedbacks very well, because the system is nonlinear, multivariate, strongly coupled, and has large scale persistent self-organized dynamical structures that cause a (comparatively) huge variation in heating or cooling efficiency in ways we still do not really understand but that were omitted from most of the early models, at least, and are still very likely not done correctly even in the better of the more recent “improved” models we are starting to get reports from. Both current and past models “succeed” in matching reality to the extent that they do by dynamically balancing comparatively large gain and loss terms. They have to do this, because on the one hand the system has large dynamical fluctuations as it responds to the enormous 91 W/m^2 annual ~7% variation of its primary driver and because it is manifestly stable. When it gets “too warm” it cools, “too cool” it warms and it is basically never like baby bear’s porridge, just right. Hence any model contains a raft of ad hoc assumptions about aerosols, water vapor, what the ocean is doing, volcanic activity, human activity outside of CO_2, where the heat is going, how it is being transported, what will happen to the patterns of its transport in the long run. Even comparatively small errors in parts of this — which all has to be boiled down into a horrendously coarse grained approximate form to be included in climate models at all compared to the scales where the local dynamics actually work — can make large, dramatic errors in the model predictions because the real climate changes comparatively slowly but building a small number by subtracting two large numbers is intrinsically a low precision process. If I subtract two processes, one that yields 100 plus or minus 10 (where the 10 could easily be systematic, not normal, dynamic error) and the other that yields 90 plus or minus 10, how significant is the resulting 10? Or better yet, how much confidence can we express that the resulting 10 is correct? Not a whole lot. Stevefitzpatrick -thanks, my mistake on the lower bound. IPCC reduced the lower bound from 2 to 1.5 deg C in the AR5 to show that the lower range of warming now falls within the IPCC’s range of “likely” possibilities. I imagine this was done to reduce criticism and better match up with real empirical data today reflecting the current hiatus. Interestingly, the lower bound was 1.5 deg C in the first three IPCC assessment reviews. My “climate sensitivity” mentioned – as shown at the bottom of the post – came simply from plugging 400 ppm and 800 ppm into the regression equation and subtracting the two temperatures to give the delta temperature for doubling of CO2. Hope you appreciate the need to do this kind of estimate over long periods. I have a few charts showing temperatures versus CO2. First, how log CO2 warming really works across the full spectrum of possible CO2 levels. Most of you have seen this before but, for those that haven’t, it is an interesting perspective. Then, how temperatures are really responding to the log warming to date with more of a Zoom-in. I’ve even adjusted the global warming theory line to account for a lag in the temperature response of 30 years to get to what the IPCC assumes for the (very close to) equilibrium CO2 temperature response. The actual temperatures to date of Hadcrut4 and the lower troposphere are adjusted for the natural variables of the ENSO, AMO, volcanoes and (the tiny) solar influence. The theory is just far off so far and we only get to 1.2C to 1.8C by the year 2100 based on the way the real Earth is responding to real CO2 so far. And then going way, way back for the last 750 million years. CO2 and Temperature here are backfitted to be at the same exact time, ie the equilibrium CO2 sensitivity value. Technically, I think the relationship is random or Zero and the Earth’s Albedo is really controlling the average temperature, not CO2. Climate observations suggest CO2’s role in climate is ~0%. I base this statement on all the climate data analyses I’ve done to date. Government-sponsored theory suggests otherwise. In all the time I’ve followed the climate discussion I’ve never seen a shred of empirical evidence supporting the government-sponsored CO2 narrative. Lukewarmists are the problem. They want us to interpolate between fantasy & reality to pursue social compromise at the center of some political axis that harshly excludes the possibility of accepting reality. Yes, Paul, that is the way I see it also. I have been waiting since the very beginning of this scaremongering for any real evidence that CO2 on net warms earth’s climate. Interesting charts! The CO2 with feedbacks looks like a complete fail. As I was trying to get Nick to admit; we are well into the time frame where the feedbacks should be manifesting. It appears co2 with no feedbacks may be the best so far. Lindzen states that CO2 is 5 percent of the total 33 degrees of the planetary GE. The remainder is mostly water. I’ve read various sources that agree that the CO2 IR effect is NEARLY saturated. Taguchi? What is he source of the first graph. It resembles those I remember plotting from MODTRAN. IIRC David Archibald also had some WUWT posts on this log effect some years ago. You should make this a top article. In particular I like your scatter plot at the end. I don’t think that even most climate scientists are aware of this. If they were, the discussion would really be over, as it emphasizes the fact that a) there are multiple macroscopic climate states possible for the world (probably based on circulation patterns and the layout of the continents and state of the sun); b) that overall, there are nonlinear factors that “clip” warming somewhere between 0 and 5 C anomaly relative to today; c) those nonlinear factors work and provide negative feedback out to truly high levels of CO_2, close to 1%. Unfortunately, the scatter plot is still too arguable because it clearly is projective over these other factors. One has to control for the state of the sun, the condition of the Earth’s orbit, the location of the continents, the patterns of ocean and atmospheric circulation. We have to presume that it wasn’t CO_2 or orbital factors or changes in the state of the sun that kicked the Earth into the Pliestocene 3.5 million years ago, although the changes that occurred with the closing of the Panama isthmus may have created a condition where those factors resulted in a bistable oscillation into ever increasing glaciation. We can “barely” measure aspects of ocean circulation at that time, and are quite clueless about atmospheric transport and decadal oscillations and so on. We are trying to guess (well, “compute” what will happen to the climate by linearizing a highly nonlinear system with huge internal feedbacks (most of them net-negative) at an inadequate spatiotemporal scale and using the crudest of approximations to the neglected fine-scale dynamics. Not a good idea. I totally agree with rgbatduke and others that what I did here is a simplification and ignores other factors such as aerosols, solar irradiation, southern oscillation etc. However, in the policy debates simple pictures can be persuasive and make lasting impressions. The comments here seem to support this idea. Secondly, for the observed result, the dependent variable, e.g., global mean temperature, to be flatline implies that over the past 17+ years all of the other (independent) variables would have just canceled out the effect of CO2 forcing. Which is what folks the climate folks like Kevin Trenberth are saying on the lecture circuits. How conveeenient. The fingerprints of the Department of Redundancy Department notwithstanding, my biggest problem with this is that I’d guess it’s a bald-faced lie. 300 million years ago, the oceans had FAR less salinity than today. My best SWAG effort would put the ocean pH at something in the ballpark of 7.5. Hell, even if it were 7.8, it’d still be a far sight more ‘acidic’ than it is today. The more I read from Messr. Jarraud, the less I respect him. Just spotted this after making my comment below. A version of this story appeared in the September 9 Washington Post as “CO2 levels in atmosphere rising at dramatically faster rate, U.N. report warns,” by Joby Warrick. In the same issue was an opinion piece by the CEO of the Audubon Society asking us to “give birds a fighting chance” against global warming. So, if the “equilibrium is expected to take centuries”, how can the 2100 CO2-dependent temperature increase be estimated? And most importantly, how can you exclude the possibility of intervening (still not detected/understood) forcing(s) that could totally revert the hypothesized (but not “proven”, let alone “quantified”) CO2 effect in the future? (and preventing an equilibrium to be reached). Would you bet the world economy only just on this number? Odd little facts in the chaos of it all. Mt Rushmore had a nice snow yesterday. The gov. tax payer webcam recorded it. This hour snow still on the trees, ground, mountains of Glacier National Park. The gov. tax payer webcams have it live now. The one at Goathaunt is nice three others show the still remaining snow cover. Myself I am betting lots of seed wheat, ferterlizer, hard work that I have enough CO2 to make a good wheat crop to feed the loons who say CO2 is a danger. The more you study the climate/weather chaos the more you find growing chaos. Sorry for a dumb question, but why is it that we can accept a single station in Hawaii for global Carbon Dioxide levels, but need a mixmaster to create temperatures. Ignoring proxies for both, we could still look at 100 years of data. And every pristine, documented, unmoved, properly sited, rural temperature record I’ve ever seen does not support much warming at all, much less catastrophic warming. Basically a day’s worth of sunlight has a lot less impact on Mauna Loa CO2 concentrations than it does on ground level temperature. Ditto traveling some distance on the ground. Also because the ocean surrounding it is relatively barren, and Mauna Loa is relatively high and locally barren (which is why the astronomical observatory preceded Keeling’s location choice), so that local biological impacts on atmospheric CO2 concentration are minimized. Richard is completely right. Of course a sunny day will lead to a high temperature. So use the 12 month running average of a well sited rural station. Every constant set ever examined that is not affected by UHI shows no Global Warming. My musing. Look to the past for this increased outgassing of CO2. It takes 700-1000 years for the biggest CO2 sink we have to cough it back up again. The Medieval Warming Period saw incredible greening of northern latitudes that to this day are now under ice. Where did all the CO2 in the over-abundant flora and fauna disappear to? The oceans, where it has been slowly meandering through the abyssal bottom conveyer belt and then back up to the surface. This time lag could explain the lag we see in ice cores. And could explain the current CO2 being pumped into the atmosphere. The steady source of ancient CO2 could explain the steady pump we see in the Mauna Loa data as opposed to the fits and starts of current human sources. I think the CO2 is ancient and its source is the ocean overturning circulation. Climate change is very real. For example, the average climate of the northern hemisphere is so cold as to cause the ground to be buried under a thousand feet of ice. The cycle of glacier on/glacier off takes place every several hundred thousand years and can be clearly seen in many ways. Even as the science is settled that glaciation has taken place, the causes are still undergoing vigorous debate. Strangely, nobody seems interested in this vital comparison. Not so strangely, the solutions that are frequently demanded in the most urgent voice, all converge on a socialist worldview: statism, bigger government, higher taxes, less personal liberty. That bigger picture tells me all that I need to know about “climate science”. So, what is a good lag time to use for the lab experiments that supposedly show CO2 increasing temperature? Days? A few weeks? What? The ice core lag suggests a long slow source and response mechanism. Our sudden little blip of human-caused CO2 that is CALCULATED (NOT measured) should therefore not be considered as the driver of this CO2-temperature dance. Too sudden (the slow rise of CO2 just happened by chance to occur during a natural warm weather pattern variation fluctuation). I continue to speculate that there must be a greater CO2 source with a long steady outgassing rise time. Oceanic outgassing of a long stored huge source of CO2 seems the likely place to look. The nearest past climate that would necessitate a large absorption of CO2 would be the MWP and its slide into colder temperatures (all that cold weather caused dead and decaying carbon rich flora and fauna along with the CO2 it produced would eventually sink into the oceans at the end of the MWP). The outgassing we see today, which is global and at all monitoring stations, suggests this wide spread source. Wide spread through the action of the turtle slow and global-wide meandering store of carbon and CO2 finally brought back to the surface from whence it sunk in the first place via the oceanic overturning circulation CO2 cycle. The addition of this ancient CO2 from the oceans would add to the natural warming pattern we are in, but not be the major driver of that warmth. The current greening of the Earth, confirmed via satellite, will one day be the source of another episode of outgassing some 1000 years into the future. Do you suppose the Chicken Littles will rise from the dead and once again gather panicky people round them saying the world will end lest we repent? Come on Nick, talk to me. I won’t bite. You know that this ancient CO2 premise is possible. There is plenty of evidence for MWP CO2 to be revisiting us about now. No, it doesn’t work that way. There is evidence that warmth after an ice age caused CO2 to rise over a period of about 800 years. That’s because it stayed warm. An electric kettle might take a minute to boil. Expecting CO2 to emerge now from the MWP is like switching a kettle on for just ten seconds and expecting it to boil a minute later. So now you admit that ∆CO2 is a function of ∆T? That ∆T causes ∆CO2? If so, then we are on the same page. What happened?? Did you take a wrong turn, and end up on Damascus Ave? CO2 is less soluble in warm water than cold. That is well known. So if water warms, CO2 will be added. It seems to settle at about 10 ppmv/°C. CO2 is also added to the air when you burn fuels. We’ve burnt about 400 Gt carbon. Air CO2 has increased about 120 ppmv. The sea temp did not rise 12°C. So Nick, another argument of both sides. The oceans are becoming more acidified because they are cold, or are the oceans absorbing heat, making them less likely to absorb co2… Which? This article appears to be a red herring. There is no direct correlation claimed by any “mainstream” between any CO2 value and some immediate reaction of a climate system in terms of “temperature”. In other words: a climate system will respond only over time and largely dependent on many other factors. This is also why you cannot bring in historical charts where CO2 en temperature doesn’t appear to be in lock-step. All one is doing in proving an over-simplified graph would be … over-simplified. For the record: I do not believe man-made warming is significant enough in terms of alarms. But I don’t think the debate needs more red herrings than there already are. Taking your assertions as being true, please explain how the anthropogenic (i.e. man-made) global warming hypothesis could be falsified. Hugh, since you seem to think you understand something about how it all works, perhaps you could answer the question Nick Stokes is avoiding: what sort of lag would be expected between the change in CO2 and the temperature rise. The basic linear model thinking of the IPCC would indicate a change in forcing would intially cause rate of change in temperature. Due to the overall, net negative feedback in the system this will eventually settle to final temperature change. This is the basis of the concept of climate sensitivity . A fairly steady rise like that of CO2 will cause a lagged rise in temperature where the lag will be close to the time constant of the principal heat reservoir. For the Bern model this would seem to be something in the range of 20 years, depending on who is fitting the model. I don’t see any evidence that any sort of lag will improve the correlation but I’m open to checking out any suggestions. Maybe you and/or Nick Stokes would like to make a suggestion of what this lag should be. Hint: inconvenient truth is that it is d/dt(CO2) that correlates well with SST, not dT/dt correlating with CO2. BTW , I’ve just run the cross-correlation, unless I’ve made an error it very clearly peaks at zero lag. That is big problem for a causational argument which maintains substantail lags in the response. Unless of course there are other confounding factors that far out weight the effects of CO2. I disagree Greg, the IPCC has stated there is no lag. More co2 = higher temperatures. How could it be otherwise? What is the heat reservoir? The oceans? Then according to the graph when the temperature spike in 1997/1998 during the el Nino the oceans were releasing retained heat? Are you going to guess and say 50%? Then what does that do to the math that the IPCC uses to calculate current warming? Are you going to say that half of the warming wasn’t due to co2, and that the math model was in error? The IPCC is very cleat that co2 is responsible for all of the global warming since the Industrial Revolution began. Next, I suppose you will argue about whether it’s between 30 -70% and 50% is the half point. Still, what model could even claim to be partly correct at 30% error? That’s the low end. All 20 years is doing is saying, ‘well so far we haven’t been right, wait another 20 years’. There are no lags in the IPCC graph. The temperature should still be going up. The temperature was going up when the oceans were storing heat before 1997/1998. You can’t have the arguments go both ways without explaining why. One you have the temps going up and storing heat, and now temps are level or actually falling, and storing heat? How is this time period different? After all, we’ve added tons of co2 to the atmosphere. If anything, we shouldn’t be seeing what we are seeing according to the IPCC. My bet is sun cycles 24&25 has us in a new grand minimum before the Eco fascists stop claiming CO2 is the problem. Are you presuming that the pattern of behavior of the solar cycles for the early to mid part of the Maunder Minimum are a basis for reasonably considering that the pattern of behavior of the recent solar cycles indicates that we are likely going into another LIA? An interesting hypothesis if you are suggesting it. It does beg the question of whether the Maunder Minimum was the cause of the LIA. How was it the cause? I wonder what is the reason for such a large readjustment for last year,s co2 gain. The ESRL page shows last year as the 3rd largest yearly gain at 2.54. The two highest years shown are 1998 at 2.84, and 1987 at 2.71. What is all of this talk about last year setting a record rate for co2 increase? Those numbers are for global co2. Mauna Loa is slightly different..2.05 for 2013…2.93 for 1998…2.29 for 1987. Then they show 5 other years which register higher than 1987…2002, 2003, 2005, 2010, 2012. Yes, and those many other factors are written into the computer models. The FAILED computer models. I guess you know what physics those models are issing. As is the common response to you Walter, what is your proposed mechanism? Both sides of a debate should be subjected to equal challenge. Well if it settles in c 70 years, lets call that 5 time constants. you’re talking about time constants of 15 years, roughly. This is not supported by the cross-correlation function, which peaks at zero. I gather that the value of the “global temperature” is a point along one of the three line segments in the plot of Temperature Vs CO2 concentration; the position in the associated space of each segment is determined by least squares regression analysis. This method for determination of the value of the “global temperature” has the downside of defining the “global temperature” in terms of this particular data set. If we change the data set in any way the definition of the “global temperature” changes. Traditionally and for sound reasons the value of a climatological variable is made independent of the associated data set. What climatological variable would you consider to be independent of the associated data set? Good question. Thanks for asking it. @ Terry… Basically you’ve said nothing. Once the meaning was clear and precise about the relationship between co2 and temperature. When the first alarms were being sounded about AGW and all you had was what you have now, what do you think the result would be? You’re going to great lengths to keep a failing theory afloat. There are no least square regressions in the relationship between co2 and temperature in the IPCC graph. Otherwise, they couldn’t trot it out as being true. I’ve lost the thread of the conversation. Prior to your entry into this conversation, Mr. Whitman asked me a question and I answered it. The topic of his question was not the relationship between CO2 and temperature and the topic of my answer was not this relationship. On the other hand, your interest seems to be in this relationship. I’m not trying to keep a failing theory afloat nor have I ever done so but you accuse me of trying to do so. sorry if I misinterpreted it. And my interest is in the relationship between co2 and temp. That is the entire reason why this debate keeps going on. The parameters keep changing but the basic premise does not. I keep referring back to previous arguments that have been explanations for AGW. The bottom line is that the IPCC and Associated. have it co2 is the sole cause of global warming and is causing run a way warming. Please clarify something. Is the AR5 approach you referenced considered by yourself to be a valid example of a “climatological variable . . . independent of the associated data set” ? To clarify, the climatological variable that I described earlier for you is independent of the associated data set. The “AR5 approach” as described in Chapt. 11 of the report of Working Group 1 appears to have the same property. The latter is based upon a class of sets that is a partition of the complete set of numerical values of 10 year averages of sea surface temperatures. In Chapter 11, each element of this class is called a “bin.” An abstracted state may be formed from a bin by placing its elements in an inclusive disjunction. This state is an example of an outcome of an event. The complete set of these outcomes is an example of a sample space. The authors of Chapt. 11 define statistical quantities that include probabilities and relative frequencies on this sample space. For earlier IPCC assessment reports, these quantities did not exist. A consequence is for the associated climate models to fail to provide makers of governmental policy with information about the outcomes of their policy decisions. All of the information that policy makers were led by previous IPCC assessment reports to believe that they had in making policies was fabricated. Your clarification helped in getting an impression of your views. It’s very hard to believe that anything could have such a measurable effect on our resilient atmosphere simply by CO2 going from 3 to 4 parts per 10,000 . Good point. 300 to 400 sounds scary. 3 to 4, not so much. Just curious: Why use land temperatures when this ignores over 70% of the earth’s surface? YES!! I asked that question earlier in the thread. Land only is more sensitive to UHI and to greater variance in the tropics. The correlation of note is between temperature anomaly and the rate of change of CO2. The EPA admits in court that previous official statements about ocean acidification were not supported by available evidence. But not between CO2 levels and the integral of global mean temperature. Or in other words, between the differencial of CO2 concentration and Global Temperature. That is what Beenstock and Reingewertz found in their polynomial cointegration test for Granger causality. Meaning; a linearly rising CO2 level might lead to a constant step up in temperature but not more. More likely, that causation is the other way, and temperatures drive the rate at which CO2 evolves. Otherwise, you reach the absurd conclusion that we could drive CO2 to a million ppm and, once we stopped pumping, temperatures would decline back down. You are extrapolating too far. Exchanging the entire atmosphere against CO2 would establish a completely different system. If you avoid the absurd extremes, you can see that what I conjectured is a possible reaction of a system with negative feedbacks. There are many ways that changing temperature could produce a change in the rate of CO2. E.g., this one. What possible mechanism could make temperatures dependent on the rate of change of CO2, and not its absolute level? The correlation is poorer with NH temp anomalies and even the NH sea temps. Any noise in the data is amplified when you take the derivative so even though it is smoothed and even if there is a very good correlation between world CO2 concentration and global temperatures, that there is such a good correlation between the measurements is highly suspicious. What is more damning is that the SH land data is the most homogenised. The raw data for SH inland stations show a minimum at 1940 unlike he maximum in NH stations in 1940 (raw data). The best correlation, though, is with the best data. Here, with the UAH satellite data. Has anyone had an experiment work that well? Regarding the lags, the energy we are talking about here (photons in the long-wave spectrum) operate at the speed of light. At 300,000,000 metres/second, it takes long-wave radiation exactly 0.0003 seconds to be emitted from the Earth’s surface until it is back into outer space if it is not intercepted by an atmospheric molecule. Now, most photons are intercepted by atmospheric molecules and the average CO2 molecule holds onto the energy from that photon for just 0.000005 seconds. On average, a photon from the surface spends time in 8,000,000 different atmospheric molecules before it is finally emitted to space at an average delay of just 44 hours (including the average time spent in land and ocean surface molecules in addition to the atmospheric molecules). So where does the 30, 70 or 100 year lags come from exactly? The numbers are in fractions of a second and hours, not decades. The basic physics is not really out-lined anywhere where these lags are supposed to come from. The only heat accumulation numbers (in ocean water and land/atmosphere/ice molecules) we can point to is 0.235 W/m2/year to 0.535 W/m2/year which is not going to raise the Earth’s temperature very much at all in the long-run versus the instantaneous 0.000005 seconds to 44 hour impact that CO2 is supposed to have. So far, temps are up 0.5C (excluding the fake temperature adjustments) and we are supposed to be closing in on 1.4C if the theory was correct. At the rate the oceans are warming, they will get to 0.22C by the year 2100 and few extra metres of glacier will be exposed. The math just don’t work . Fascinating. Any idea of the residence time of disparate SW insolation? BTW, I earlier asserted to Nick that the direct affects of CO2 must be essentially right now, or in this case 44 hours. Are not all the delayed responses predicated on hypothetical amplifying feedbacks, such as lowered albedo etc? where do you get the 8,000,000 from? Of the 8,000,000 molecules how many of these are CO2 (I presume that this will be the ratio of say 400ppm), and how many are other molecules, and of the other molecules how long do they retain any energy absorbed from a collision? What is the difference between photons emitted from the land surface, and that from water, in the number of collisions and the residency time? Where do you get your 44 hours from? is not 8,000,000 x 0.000005 secs = 40 seconds? One of the problems with the K&T energy budget cartonn is that it is based on averages, whereas in the real world there is day and night (and no homogenised average energy budget as K&T suggest anywhere on the planet; it is in constant flux). One issue is that we get dolops of incoming energy and long periods of no incoming energy. At the equator/tropics, in essence, this occurs in 12 hour bursts every 24 hours, but at higher latitudes this is quite different, and at the poles it is extremely different (with, at times, no significant incoming energy for months). So if one consders the life of an incoming photon which is absorbed by the land and later re-radiated, is there sufficient time for this photon or its re-radiated cousin (or the vast majority of them) to get re-radiated out to space before the next incoming burst of energy? If the answer to this is yes, then GHGs do not significantly increase the temperature of planet Earth. At most, they simply alter the time when the lowest low during the 24 hour solar cycle occurs, eg., they push back the coldest part of the day from say 03:30:00 am to say say 03:30:40 am or to 03:31am or even to 04:00am. But so long as all the incoming energy received during the day has time to leave during the night before the next daily burst of incoming energy, increasing the concentration of GHGs would appear to do little. And if there was any gradual build up during the year, there are days when one sees temperature inversions when large amounts of energy is flushed out of the system to space; ditto at the poles where copious amounts of energy can be dumped during the winter, thereby restoring the system to balance.. Sorry, I was going off memory, the number of molecules is actually 8 billion, not 8 million. The average residency time of 44 hours includes the averages from land and ocean molecules which will hold onto the energy longer the atmosphere molecules. Its a global average. 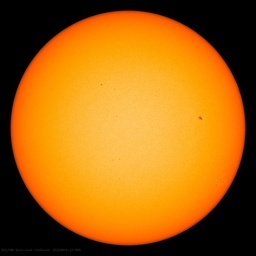 Think of it as, if the Sun shut-down tomorrow, how long would it take before the Earth’s surface temperature lost 33C, the greenhouse effect, then how much longer before it would get to the background radiation level of 2.7K (plus a small amount from internal core temperature). Not long at all. I can’t see why this is a problem per se. It’s an energy budget diagram. Not a BB temperature diagram. If you time 165 J with the number of square metres covered by Earth’s global surface and with the number of seconds in a 24h day, then you will end up with the total amount of energy from the Sun absorbed by the global surface across an average diurnal cycle. It doesn’t matter, then, how this energy input was distributed in time and space. That’s the total absolute amount. Period. Not some kind of average. And this total amount has to be shed by the system also, within an equal amount of time. Or else you get warming (or cooling, if more is shed than coming in). Again, it doesn’t matter where from or when within our time frame the energy escapes, as long as it does. It’s fine averaging fluxes when simply doing energy budgetting. It is NOT fine if trying to determine temperatures directly from any or more of the instantaneous flux intensities within the budget. If the feedbacks in the theory were correct. We are actually almost dead on the track expected if CO_2 were the only source of warming with net neutral feedbacks, but of course natural variation is almost certainly of the same scale (to neatly reverse the stated position in all of the SPMs from the alarmist ARs) and so we have no good way — yet — to even dream of disentangling the two. We certainly can’t do it based on obviously failed models, or on models that use very different parameterizations of the feedbacks that “happen” to cancel out and produce similar tracks in a reference period, as those models will (and have been observed to, in toy planet model calculations) diverge from each other, let alone the climate, as they proceed. And how can we even speak of “feedbacks” in a supposedly a priori coupled highly multivariate nonlinear PDE problem? They aren’t separable! The mere fact that people refer to things like “water vapor feedback” as if it is a separable entity means that they are either getting the physics badly wrong before they start or they programmed in the assumption that this would occur in a certain way instead of letting the model determine what the net effect of water vapor (which includes clouds and latent heat transport and direct interference with in-band CO_2) is, and the fact that it might well vary or suddenly reverse its sign in response to other, quite small, variations in state and drivers. 8.1 pH is not acidic. It’s basic. 142% increase means it was at 165 ppm in the 18th century. Wrong! Pre-industrial level was 280 ppm. Last time it was at 165 ppm was 650,000 years ago. You are so ignorant. How did you become head of WMO? Excuse me? I think you might want to withdraw that last statement, including the entirely egregious vitriol. Whether it is 41% or 42% or 43% depends on just what you consider the end point numbers, but 42% is certainly a good estimate in round numbers. Even the UN’s observation, while stated in a backwards way, is correct. Less basic is more acidic and vice versa. “Than ever” is a bit egregious, but perhaps it is understood as “than ever in the recent geological past”. And what exactly do observations like this add to the discussion? Nobody debates the 400 ppm vs the 280 ppm. Exactly who cares about the percentages per se, unless they are plugging ratios into one of the approximate log forms for estimating CO_2 driven warming as a function of the ratio of start and end time? And do you think that they cannot manage to use a calculator correctly in order to do that? As the temperature at Earth’s surface fluctuates this temperature does not approach an equilibrium temperature. “The equilibrium climate sensitivity” is a theoretical construct and misnomer with a non-falsifiable numerical value. This is true. The unit of measurement of extreme weather is the Brockway (named after the famous computer modeler, Brock Way). Since 1979, we have increased 4.9 Brockways (up 15.6%). Pretty soon we will be over the 50 Brockway mark, a figure not seen in 500 googolplexillion years. Moreover, we are 100.00000000000% sure that it is anthropogenic. If we do not cut our CO2 output, then we are in grave danger of entering an era where it is extreme weather, everywhere, all the time…no matter how the weather is. Of course tornado count, hurricane count, extreme precipitation count, snowfall account, etc., are all at historic lows, but that should not deter us from the staying on track. It is important that we set policy based on what the computers tell us how things would be, if they were only different, rather than based on, you know, how things really are. I challenge anyone to reveal to me where the oceans or seas are acidic, other than at the mouths of volcanoes deep under the surface of the oceans. I doubt CO2 have any effect in acidifying the oceans. Just imagine how vast the ocean is. And I recently read about how sea salt can alkalize water, not sure if this is applicable to the oceans. CO2 is natural, nature can handle it. Just stop poisoning the planet with gmo, aluminium, barium and poisonous metals.